The only thing Jenna Chamberland ever wanted in her life was to be a good wife and a good mom. In death, she’ll find that she still wants the same things. With stage-four breast cancer, a terminal diagnosis and six months to live, Jenna fears what awaits her family after she is gone: Her husband, Gabe, will be left to raise their daughter alone, and Mia, only seven years old, will be forced to face a world without her mother. Ten blank tapes to teach her daughter everything she’ll ever need to know. Dead before Mia ever really got to know her, Jenna exists now only in pictures and watercolored memories, and Mia finds herself struggling to remember her mother in a way that feels real. But on the ninth anniversary of Jenna’s death, she will return to her daughter through a series of audiocassettes. One tape each of the milestones of Mia’s life, and with them, a letter explaining that Mia should only listen to the tapes when the time is right. With the help of her mother’s long-gone voice, Mia may just learn how to embrace the challenges and triumphs of her ever-changing life with humor, grace and a lot of hope. Rereleased for its second anniversary, the novel that book bloggers have called "beautiful" and "unforgettable" returns with new content and tapes never before read. 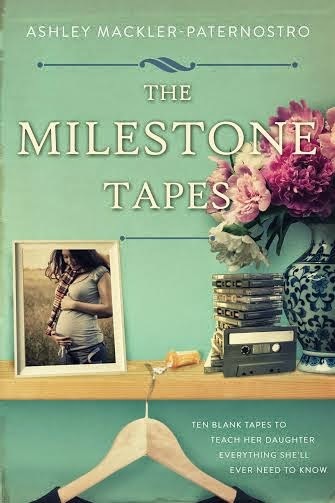 The Milestone Tapes by Ashley Mackler-Paternostro is a independent publication. I was provided a copy of this book in exchange for an honest review. The first part of this book chronicles Jenna's struggle with advanced breast cancer. She has a good marriage and beautiful daughter and fights the good fight. After an exhaustive fight Jenna passes away peacefully on a beautiful fall day leaving behind her devastated family. But, because Mia was only seven years old and she would not have her mother around for all those milestone moments when a girl needs a mother, Jenna has the foresight to record a set of tapes for her daughter to listen to as she goes through the various stages of her life. The second half of the book deals with life without Jenna. We are privy to the words that Jenna recorded for her daughter and we see how things turn out for Gabe as he eventually moves past grief and realizes that Jenna would want him to be happy and so he begins to date and live his life once again. This is a book that requires tissues in hand! Yes, a box of tissues should come with the book! LOL! Can't wait to read this one!!! What a wonderful book! Very emotional subject. Thanks for sharing.